On the payslip tab over to the right you will see the following under the heading "To show on Payslip". Click on any of these to turn the payslip balance on or off for this employee. 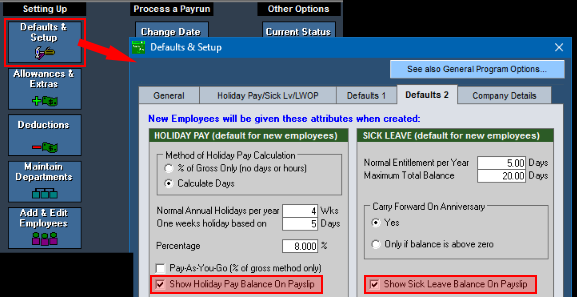 You will see sections for Holiday Pay, Sick Leave, and Other, which each have the payslip balance option. You can also show the holiday pay balance including an estimate of the accrued days (or hours) since an employee's last anniversary date. This will be shown both on screen and on payslips. For example the normal setting as per the Holidays Act does not show an accrued estimate. These two examples are both the case where an additional 6 months have passed since the employees last anniversary date (entitlement date). The option to show "Individual Days" is also given. 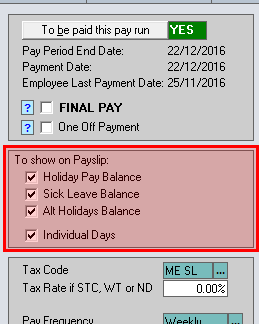 If you are entering individual days into the time sheet, then ticking this option will show the days individually on the payslip. If this is not ticked, a summarised total will be given. As with leave balances, this can be turned on or off for individual employees at any time.